There are many things that are important to us here in the Chicago area, and one of those things is keeping our beautiful area and our community clean and green. That’s why we’re glad to offer an extensive lineup of great “green” Toyota cars in our inventory here at Midtown Toyota. And not only do green Toyota cars at our Toyota dealership in Chicago help reduce the use of fuel and produce fewer emissions, they are also stylish, fun to drive, and dependable. The 2016 Toyota Prius available from your Chicago Toyota dealers made a big splash when it arrived more than 15 years ago. It revolutionized the idea of what a fuel efficient green car could be, saving an estimated 12 million tons of harmful CO2 emissions in the process! The 2016 Toyota Prius comes equipped with the ground-breaking Toyota Hybrid Synergy Drive® system that combines a gasoline engine and battery powered motor to produce a system total of 121 horsepower while achieving estimated combined fuel economy ratings as high as around 56 miles per gallon. Its interior is spacious and versatile, and can comfortably seat five passengers and accommodate 65.5 cubic feet of cargo. And it offers an available head up display and available Qi-compatible wireless charging system. Coming from the automaker that’s been named the Most Fuel-Efficient Full-Line Automotive Manufacturer, the 2016 Toyota Camry Hybrid offers just about everything you love about the popular, top-selling family sedan, and increases its green capabilities by adding the automaker’s advanced Hybrid Synergy Drive system. Combining a gasoline engine and battery powered electric motor, it produces 200 system total horsepower all while achieving estimated combined fuel economy ratings as high as around 41 miles per gallon. It offers a comfortable interior that can seat five passengers and its big trunk that can hold 13.1 cubic feet of luggage, groceries, and gear. The 2016 Toyota Camry Hybrid also offers an optional Toyota Entune® App Suite multimedia system, and the safety and peace of mind of an optional Pre-Collision System. The 2016 Toyota RAV4 Hybrid takes one of the most exciting and adventurous crossover vehicles out there, and raises its environmental awareness to exciting new levels and makes it a whole lot greener with the addition of the automaker’s Hybrid Synergy Drive system. It produces a system total 194 horsepower, which is directed to all four wheels via its intelligent on-demand all-wheel drive system. It helps the popular crossover achieve estimated combined fuel economy ratings around 33 miles per gallon. The 2016 Toyota RAV4 Hybrid also offers the great versatility and space that make it such a great companion on all your adventures. It can accommodate five passengers and as much as 70.6 cubic feet of cargo. It can also tow as much as 1,750 pounds. Toyota is very concerned about helping keep our environment cleaner and greener — something we can appreciate here in our beautiful city and our beautiful part of the world. That’s why we’re proud to offer such a great selection of “green” new Toyota cars in our inventory. 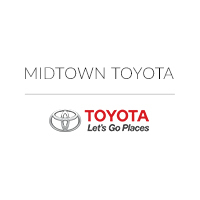 So stop in to our conveniently located Toyota dealership at 2700 N. Cicero Ave in Chicago today to learn more about going “green” in a new Toyota car from Midtown Toyota!